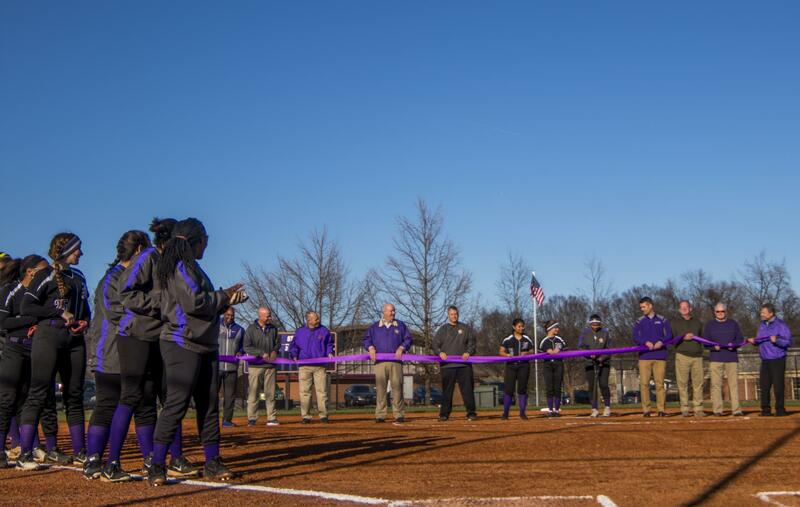 Bardstown City Schools officially opened the new softball field with a grand opening ceremony Tuesday, March. 26 before the Lady Tigers took on Breckinridge County. Cutting the ribbon on the field is senior Tekeyeh Young. From left, are BHS basketball coach James "Boo" Brewer, BCS athletic director David Clark, BCS director of pupil personnel, BHS principal Chris Pickett, Lady Tigers softball head coach Todd Kisegy, senior softball player Rosa Morales, senior softball player Lauren Miles, senior softball player Tkeyeh Young, BCS superintendent Dr. Ryan Clark, BCS Board of Education chairman Franklin Hibbs, III, BCS Board of Education member Jim Roby, and former BCS superintendent Brent Holsclaw. As part of Tuesday's festivities, softball players Sophia Sharp and Lauren Miles performed the National Anthem and former superintendent Brent Holsclaw threw the ceremonial first pitch. For more pictures of the Grand Opening Ceremony, visit Facebok.com/BardstownCitySchools.